Power adapter thingies who’s devices have long since escaped. Dad’s study is full of boxes of things he’s kept that might one day come in handy. Neatly organised. It’s difficult for me to value them beyond the stories they tell of his own values, which make me smile. Deconstructing dad’s study is full of pain and smiles. Mum follows me in and I talk to her about what to do with things. She’s thrilled when I find one box that holds an inbound book dated 1896, a present she bought for dad that she had thought lost. Dad teased, irritated, and fascinated me. I loved him, he knew it. I’m so glad he’s left lots of puzzles and surprises to unravel and left us all knowing he was deeply loved. This scribble was published on Thursday, January 2nd, 2014. You can follow any banter on this scribble with the RSS 2.0 feed. You can share your inspired musings after typing the anti spam word near the bottom of the page. But no Pinging because its too naughty. 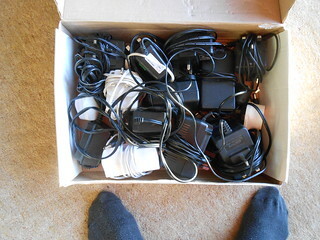 I have redundant chargers in various drawers… and I’ve just moved, so I should have sorted it out!